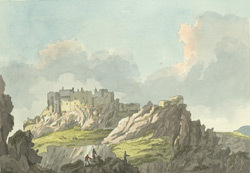 View of Mount Orgueil in Jersey, by G. Heriot . From the13th through to the 15th centuries Mount Orgeuil Castle, sometimes known as Gorey Castle, was of great strategic importance in defending the island of Jersey against invaders- whoever held the castle, controlled the island. Its position on a rocky promontory overlooking Grouville Bay and approachable over land on just one side, made it ideal for defence against Medieval warfare. However with the introduction of the cannon, withs its stronger artillery and longer range, the castle could no longer be so easily defended and in the mid 16th century Queen Elizabeth ordered the building of a new castle in St Aubin’s Bay.